This pamphlet was written as an urgent call to arms. 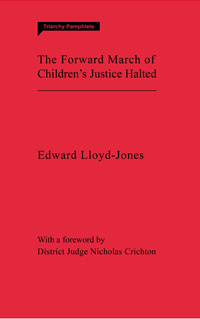 In 2008, the Labour government in the UK was in the process of subverting the children's justice system through a deadly combination of legal aid cuts, court fee hikes, market dogmatism, and reductionist protocols. What had been an inspiration to all professionals involved in justice for children was being systematically dismantled. The Children Act 1989 had revolutionised childcare proceedings, making Legal Aid available to parents and allowing an experienced social worker or guardian to build a relationship with the child to ascertain their feelings and needs and represent the child's interests to the court. All parties, including the local authority, were equally represented. The Public Law Outline allowed for a decision about the future care of a child to be made without the child being represented. The openness, empathy, intellectual curiosity and rigour required of, and willingly given by, all professionals in the field was brushed aside in favour of a formula that made a mockery of common sense. Policy makers and anyone working in or studying the field of children’s justice.